At Howard Carter Lease Ltd, we’ve been exceeding our loyal customer’s expectations for over 55 years. Today, we remain committed to providing an unrivaled vehicle purchasing experience – that removes any pressure and provides our customer’s with the unparalleled level of service, superior vehicle selection and the affordability they desire. 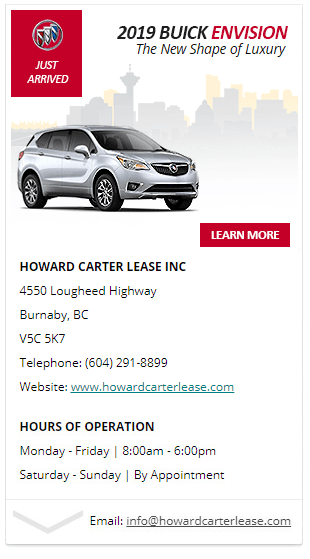 Why Howard Carter Lease Ltd? Large selection of inventory (fully stocked) – over 1,000 (new and pre-owned) vehicles to choose from including; Sedans, SUVs, Compacts, Mini Vans and Commercial Vans (including exotic and performance vehicles).